British PM rips Labour leader over his refusal to discuss Brexit, takes jab at him on comments on Hamas and Hezbollah. 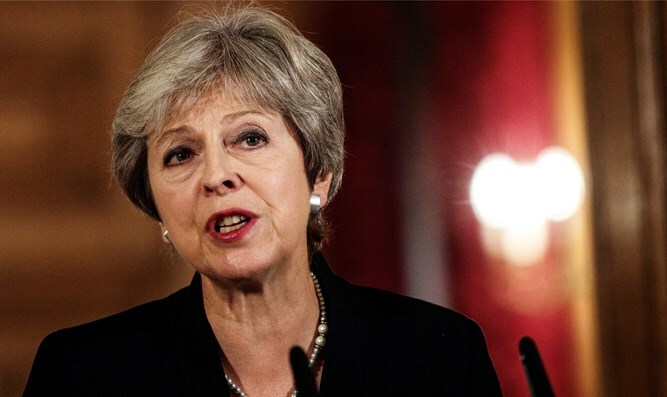 British Prime Minister Theresa May on Wednesday ripped Labour leader and opposition head Jeremy Corbyn over his refusal to sit down with her and discuss Brexit. In her remarks, May took a jab at Corbyn, who has been embroiled in controversy over his past connections to terrorist groups. “He has been willing to sit down with Hamas, Hezbollah and the IRA without preconditions but he will not meet with me to talk about Brexit,” May said during Prime Minister’s Question Time in the House of Commons. Corbyn has been plagued by anti-Semitism, both on his part and by members of his Labour party. Dozens of Labour members have been suspended over their anti-Semitic statements, and the party has been criticized for its failure to deal with the phenomenon. More recently, the Daily Mail newspaper published photos of the Labour leader at a cemetery in Tunisia holding a wreath near the graves of some of the Palestine Liberation Organization (PLO) terrorists who were responsible for the massacre of the 11 Israeli athletes at the 1972 Munich Olympics. The Labour leader, however, insists he is not an anti-Semite. In a recent interview with the BBC he described anti-Semitism “as a scourge in any society, I have opposed it all my life…I have spent my whole life opposing racism in any form and I will die fighting racism."